High-earning college graduates have moved into areas like H Street, which have seen the rapid development of new bars and restaurants, but taken away from some of the less expensive living areas of the city. When 2010 alumna Greta Twombly started apartment-hunting in D.C., she did what hundreds of GW students do after getting their diplomas: move to a rowhouse in a cheaper neighborhood close to new shops, bars and friends. A wave of relatively high-earning recent graduates has flooded neighborhoods like 14th Street, U Street, Adams Morgan and Navy Yard, contributing to one of the quickest population upswings of any city in the country. But that rapid movement has also threatened the city’s lower-income residents who can’t pay rent or mortgages when there are sleek new apartments, hip ramen restaurants or bars around their homes. “The joke is every time you walk out of your house a new bar or restaurant is opening up,” said Twombly, who added that she was concerned the Shaw neighborhood she lives in would soon lose its charm. As neighborhoods across D.C. develop, city leaders have rushed to make sure more protections are in place. Mayor Vincent Gray pledged an additional $100 million for affordable housing in his annual State of the District speech two weeks ago, just after the D.C. Council passed a bill to eliminate property taxes for low-income elderly residents who have lived in the city for at least 20 years. The influx of young professionals has helped create D.C.’s gentrification dilemma. Rent prices doubled between 2000 and 2010, while the number of affordable housing units decreased by half, according to the D.C. Fiscal Policy Institute. The institute also reported last week that the bottom 20 percent of city residents earned an average of just $9,900 per year – far less than the $85,000 needed annually to support a family of three in the District. Cities across the country have made even stronger efforts to combat the effects of gentrification – massive spurts of urban development that force out small businesses and low-income longtime residents. A Philadelphia program lets homeowners reduce their assessed home value for tax purposes and another in Detroit cuts property taxes by up to 20 percent. Foggy Bottom’s Council member Jack Evans, who has spent more than two decades promoting development across the city, said the benefits of development – new restaurants, more grocery stores and safer neighborhoods – outweigh the consequences. “We’re doing more than any city in the country to protect low-income people,” Evans said, listing off examples like rent control policies and property tax caps. But more than half of D.C. residents believe that the city’s booming development benefits whites and wealthy individuals more than blacks and low-income residents, leaving the city divided along racial and socioeconomic lines, according to a January poll by the Washington Post. Parisa Norouzi, executive director of Empower D.C., a grassroots organization that has fought against gentrification for more than a decade, said city leaders should do more to stop the displacement that follows rapid population growth in the city. To do that, Norouzi said policymakers should support local business owners, build more affordable housing and save public land from developers. “The ongoing struggle is, can we get neighborhood improvements without gentrification so that the cost of living doesn’t push out the folks who have been pushing for these improvements so they aren’t even able to enjoy them?” Norouzi said. Those improvements include a steep decline in violent crime in pockets of the city. 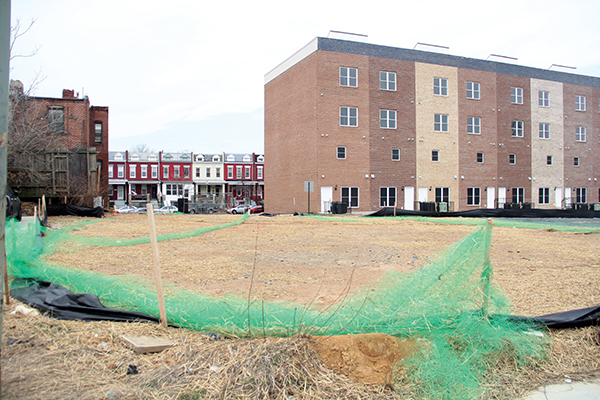 The leader of the Logan Circle Community Association, Tim Christensen, said the development of his neighborhood has improved the quality of life by making the streets safer. Now, he said the neighborhood is noticeably safer and there are 72 restaurants between Thomas Circle, U Street and 14th Street. “When I moved here, there were maybe four,” he said. Violent and property crime incidents in the Logan Circle area have both decreased since 2012, according to data from the Metropolitan Police Department. Property crime – including theft and burglary – decreased from about 280 incidents in 2012 to about 250 incidents last year. If gentrification runs out of control, it can create a loss of cultural diversity in a neighborhood, warned Maurice Jackson, an African-American studies professor at Georgetown University. That means fewer black-owned businesses, as young and often white professionals fill those neighborhoods. D.C.’s black population slipped below 50 percent for the first time in history in 2011. Housing prices are one of the biggest forces behind the lower-income exodus that has pushed families to poorer counties outside the city, said Council member Tommy Wells. Wells, who is running for mayor, said there is “no silver bullet” to stop displacement and that there’s no way to stop property values from rising out of reach for residents. Instead, he said the city had a responsibility to protect older and poorer residents from being displaced by offering tax breaks and subsidized housing when possible. For instance, to preserve the area’s neighborhood feel, Logan Circle offers affordable housing units such as a four decades-old complex for women called N Street Village. Kathryn Howell – a researcher at George Mason University’s Center for Regional Analysis who studied population shifts in D.C. – said the question leaders have to ask is how to ensure that development benefits all groups. “We have to be honest and say that change is going to happen and development will happen. How do we do it equitably?” She said, adding that the cost of living, housing and going out to eat will continue to rise. The H Street corridor shows the same signs of a rapidly developing neighborhood: pop hits floating out the open window of a chain restaurant, ever-present “under construction” or “for lease” signs and girls in Uggs walking past decades-old barber shops. Chris Zarconi, who graduated in 2004 and now lives at H and 13th streets, remembers having to give his D.C. friends directions to his house when he first moved. Now, he sees people in GW hoodies walking around his bar-lined neighborhood. “I think, going to GW, I had the same mentality that a lot have – Northeast and Southeast is terrifying, and I’m a white boy from Ohio who would never have any reason to go there,” Zarconi said.